Our Mission style sofas, love seats, chairs and ottomans are perfect for any room. 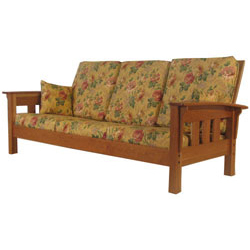 With their solid hardwood frame only the cushion covers need replacing over the years. Options include: choose from hundreds of our fabrics, or provide your own (with a reduction in price), length, depth, and height can be customized. To see more in person, visit our Showroom in Middlebury, Vermont.